One big regret I have is not getting the recipe for my Grandma June’s Hamburger Soup. She passed away at the end of 2012. I miss her dearly. I was lucky enough to get some of her handwritten recipes. I’ve already shared her Hurry Chicken. I decided to take a crack at her Hamburger Soup and see if I could get it close. Grandma June always referred to it as “Hamburg soup”. Beef was always plentiful around grandma’s house. Her life partner, Clarence, is a beef farmer and she always had a freezer full of his beef. I hope my grandma approves of this version of her soup. I love it because it’s hearty, filling and flavourful. It’s pure comfort food that is perfect to enjoy on a cold winter’s day when you’re tucked inside the house. I hope you enjoy this recipe as much as my family has. Every time I make it, I think fondly of all the precious memories I have of my grandma. You might also like this Cream of Celery Soup. Has your grandmother shared any of her recipes with you? My version of my grandma’s favourite soup. It’s hearty, filling and flavourful. Enjoy a piping hot bowl on a cold winter’s day. In a large pot, cook ground beef and onions on medium high heat. Once beef is browned, add in the rest of the ingredients and stir to combine. Bring to a boil. Reduce heat to medium low. Simmer for 40 minutes. Serve hot. 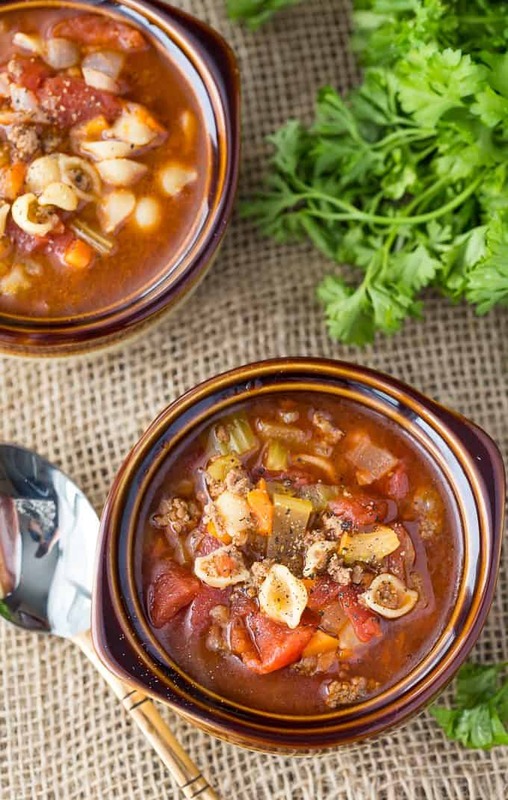 This soup looks so delicious and easy to make. It would be great right now to have some because it is so cold outside! Thanks for an awesome recipe. I am going to make it. Looks delicious! I would call it a stew though. I do something like this and I call it a chili; it has no pasta. Sounds like a nice hearty soup. I have pinned it to try it out. Thanks for sharing. Thanks i have all the ingredients i’m going to try this on the weekend !! 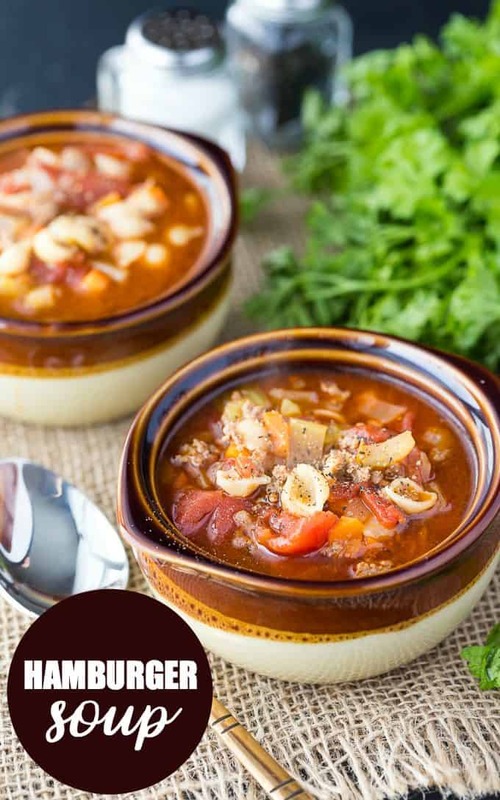 Hamburger soup has always been one of my favourites, I love it with green beans and zucchini too. We often have Soup Sundays.. this looks like one I would like to try! That does look warm & filling on a cold winter’s day. Would this work in a slow cooker? I haven’t tried it in the slow cooker, but I bet it would work there too. Can you use turkey meat instead of beef? I think ground turkey would work too! This is one soup my whole family loves. This sounds extremely delicious! I’d totally love it. This just might be what I make for dinner tonight. Thanks for sharing! This recipe looks and sounds wonderful, Stacie. Our family loves soup of any kind and I think we’re definitely going to give this one a try. Thanks so much for sharing at our #TrafficJamWeekend linky party. Hope to see you there next week, too. This looks so good! Can’t wait to try this with gluten-free pasta. Pinning! Your soup looks amazing. Thanks for sharing at the Inspiration Spotlight party. Pinned & shared. This looks so hearty and delicious. I bet even the kiddo would love this one! This soup looks like the perfect soup for the winter blahs. Something about a steaming bowl + some bread or maybe a salad … so yummy in the cold months. Thank you for sharing! This soup looks delicious. Can’t wait to make it. 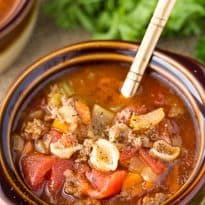 It’s good in a slow cooker too , I love this I also call it hamburger soup. This soup looks so delicious,i can’t wait to try it !! Are the shells cooked or uncooked? If uncooked when di you add to the soup? Hi Marilyn! They are uncooked. Put them after you brown the ground beef along with the rest of the ingredients. Can I make this in a crock pot? How long and when do I put the noodles in? I’m so excited to try this, Thank You for posting! I haven’t tried it in the crockpot but I’m sure it would work. I would put the noodles in uncooked about half way through and let them cook in the crockpot. I’m thinking on low for 6 to 8 hours. If you try it, let me know what you did and how it turned out! these look good. will have to add them to my recipes, thanks. I just made this tonight for supper. This was delicious! My husband and daughter loved it too. Thank you! This looks like really delicious soup! Is it tomato consommé that you use? Thank you. Going to try it tonight. 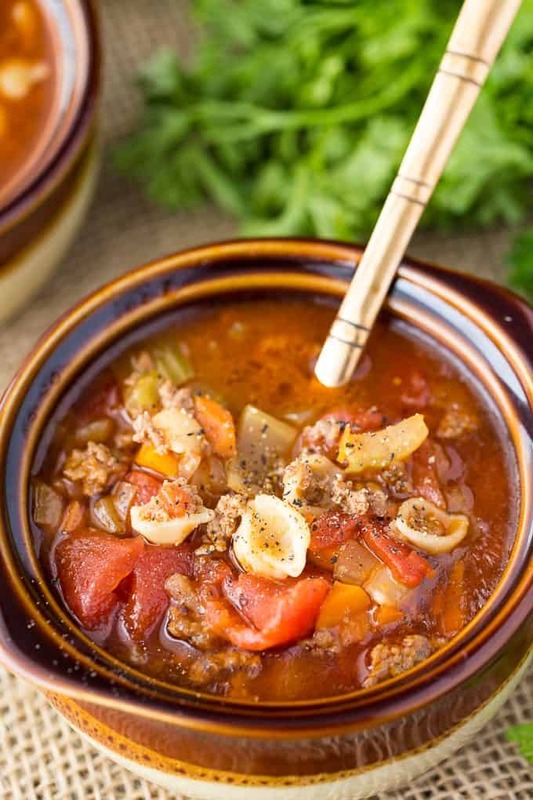 I love Hamburger Soup and my Grandma Jeanne’s was my favorite as a kid! I would love to make this recipe for my family! 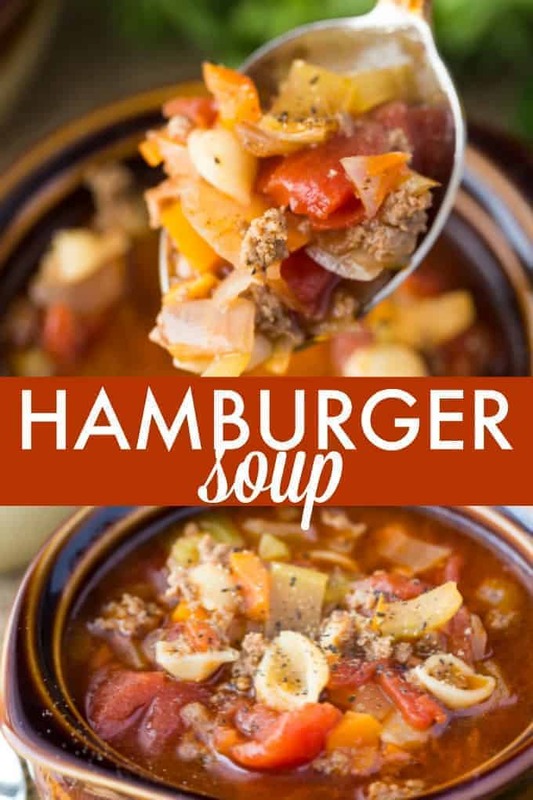 Hamburger soup is one of my Favorites , i will def try your recipe , it sure looks scrumptious 🙂 thanks for sharing the recipe ! My grandma made this soup and it brings back the same feelings for me. Our family loves this soup and we make it quite often. Its real nice in the winter but we even have it in the summer. Now I am hungry for some. Its so easy and quick to make too.